August is Back to School month and we’re focusing our attention on educational products and solutions all month long. School is an integral part of our personal and professional development- something educational institutions know all too well. What’s more, the structure of education has shifted away from the basics and have become something more robust. Students are connected socially and with technology which means their needs in school are far more dynamic than ever before. Universities want to attract top educators and students and to do so, institutions are making investments in design- yes, design. Design in education wasn’t really a priority for many decades, however, these institutions recognize the monumental shift in the needs of it’s students and educators from K-12 to post-secondary. Here in Southern California, we’ve had the opportunity to be a part of this shift- working with both public and private institutions to develop places of learning that are functional, comfortable and flexible. Working with our designers, facilities managers, and project managers, we’ve compiled a list of trends we see in education and are delighted to share them with you! While collaboration isn’t a new idea per se, the way in which we collaborate in the education space is. Collaborative tables, seats with swivel functionality and desking that can pivot or rotate are trends we see. Having spaces that adapt and flex to the variable learning and teaching styles promotes success for everyone involved. Classrooms have come a long way since the late 1800’s with bench seating a thing of the past and mobility and flexibility a thing of the future. This trend extends far beyond whiteboards as nearly every aspect of the classroom has changed in a short amount of time. Worksurfaces for students has expanded with built-in storage and other functionality becoming a standard ask. Aisles and rows of desking are less common, and decision makers are taking a much more organic approach to layout and design. How do we meet this need? Desks can be offset at an angle and positioned differently depending on the class. Dedicated areas for collaboration help to get students out of their seats and moving around the classroom. Technology is integrated into the classroom and used as a compliment to more traditional teaching techniques and more recently, we’re seeing lounge seating inside the classroom to offer variation in environment. Technology, whether you like it or not, is here to stay- and that goes for education as well. While devices can be a legitimate distraction, we’re seeing technology being embraced, and we encourage our education customers to do the same. Sharing digital content is a must in order to have a functional and connected space. We’re seeing more emphasis on wireless technology, presentation software and similar products for educators as well, helping to elevate the learning experience with regard to new media and technology. Every institution wants their particular brand and culture to shine through and this can easily be accomplished when working with a designer on your project. Prospective students flock to a school for recognition, prestige, and the unique culture a school embodies and markets itself as possessing. Color (both interior and exterior) can be used creatively and with purpose to meet this need including wayfinding and navigation across campus and inside of buildings. Color can be used to identify specific areas or functions to be performed which can make a huge impact on students. 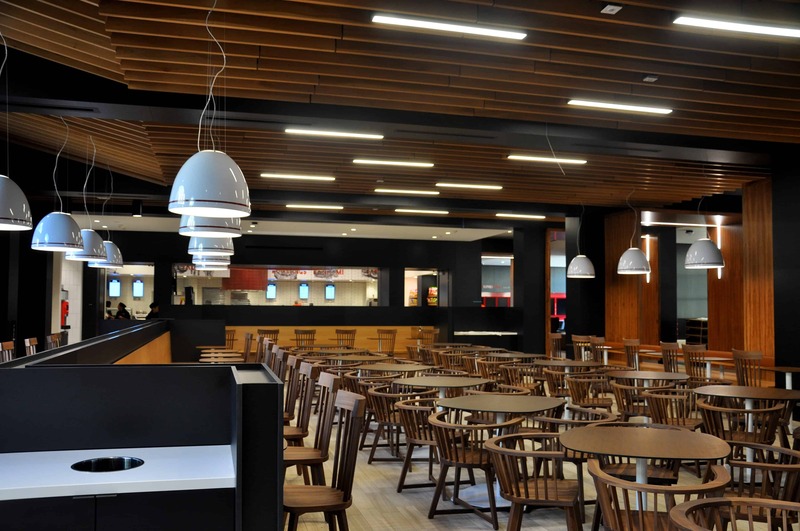 Additionally, furniture can be tailored to university brand standards and add contrast in classrooms, lunchrooms and communal hubs throughout the campus. Being on brand is a must and there are many options to accomplish this that are affordable and meaningful. No matter what your need, there is a solution when it comes to education. Furniture and fixtures can be used in creative ways and classrooms can break away from the conventional and step into the modern world. For educators, it’s about embracing these changes, not fighting them. It’s about understanding your individual needs as well as the needs of students and staff to meet them. It is an exciting time in education right now, and we’re humbled to be a part of that change in Los Angeles. What do you think about these trends? Are you an educator and if so, what do you see changing in the education space? Social media is meant to be SOCIAL so, feel free to comment and join the conversation!